As you may be aware this year Plymouth Dance has a focus on creating opportunities for older dancers as well as promoting Dance for Health. We have been working hard to build relationships with local organisations and people providing services and advocacy to expand our knowledge and grow our networks. We have become dementia friends and ensured all of our Tea Dance practitioners have training in both Dementia and Dance and Parkinsons Dance. 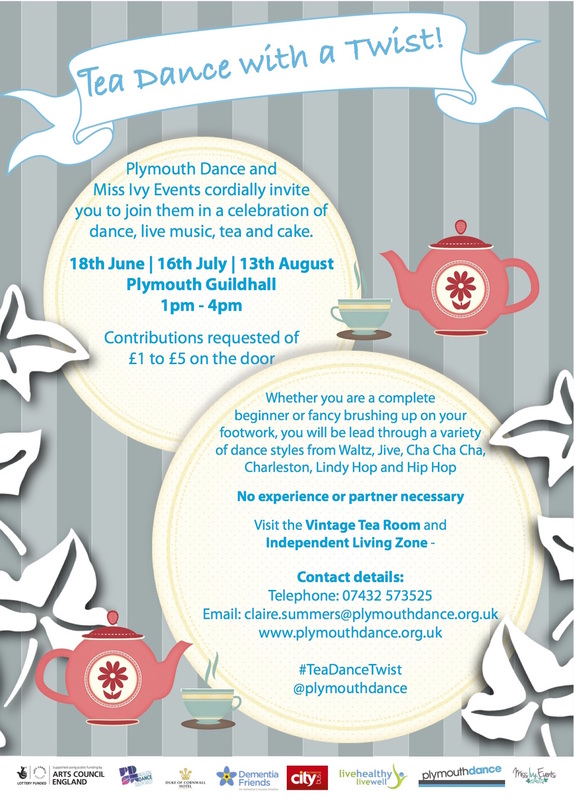 We are now in the final stages of our project planning and on the 18th June our first Tea Dance With a Twist! will take place at Plymouth Guildhall. To make sure this project is the very best it can be we have launched a Crowdfunder to try and raise some much needed money towards this project. We also have some fantastic rewards including VIP entry to all three Tea Dances for you and a friend, song dedications from our wonderful band and some that are more focused towards sponsorship and support form organisations. So please if you can possible support this project visit our project file on Crowdfunder. Make sure you click follow and/ or sign up for our mailing list to be kept up to date will everything dance in Plymouth!